I’ve used only chemical free and natural skin products for 20 years now. I truly believe that in the long run, this is much better for your skin and helps avoid all the inflammation and side effects from chemicals which will take their toll eventually. So it’s a bit odd that when it comes to make up I just slap on whatever I like with no regard to the chemicals they contain. I have over the years tried a few natural ones, but haven’t found anything that I love. However, along with skincare, chemical free make ups have really come into their own and there’s more and more to choose from. I’ve decided to really explore what’s out there and see if it’s any good. I’ve started my quest with foundations and tinted moisturisers. This has got to be one of the most important make ups items, don’t you think? It can literally make you glow and your skin look great or it can make you look like you have some sort of horrible pink or orange type mask on! Never a good look. I have actually previously written about Green People’s Age Defy+ Tinted Moisturiser which is a fantastic product that also contains SPF 15, so covers a lot of needs all in one go. But what else is there? I honestly wasn’t expecting to particularly like what was out there, but to my amazement I was blown away with what I found. Some absolutely WONDERFUL foundations that are completely natural and make your skin look amazing!! All the ones listed below contain mostly organic ingredients, are completely natural, full of nourishing oils and vitamins and smell great. These are literally some of the best foundations I’ve EVER used. Inika Liquid Foundation – this is full of antioxidants, vitamins and also contains hyaluronic acid so nourishes as well as covers. It is almost completely organic and is vegan. It’s very hydrating and goes on smoothly giving a lovely dewy coverage. It makes your skin look pretty flawless I have to say and blends like a dream. The hyaluronic acid plumps up the skin and diminishes fine lines. Comes in 4 shades. I tried “Cream” and “Beige” and actually liked both colours although “Beige” is darker and may be best for summer. 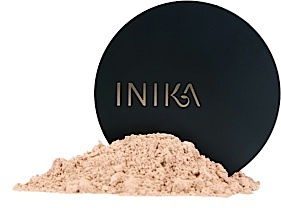 Inika Mineral Foundation – I have to admit I haven’t tried many mineral foundations as I prefer a dewy cream to a drying powder. I know, however, that mineral foundations aren’t meant to be drying and are supposedly very light giving the face a super natural glow. Well that’s exactly what this one does I have to say. It’s actually a concealer, foundation and powder in one. It also contains SPF 15 which is perfect as it’s so light. It’s particularly good at covering scarring, imperfections and pigmentation. Comes in lots of shades but I tried “Strength” and “Unity”. The latter being the best for my skin. I am now a convert and will definitely be keeping this in my make up bag. 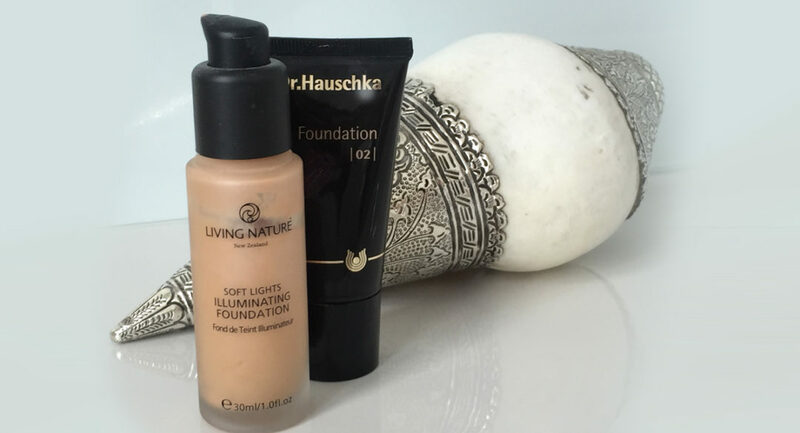 Living Nature Illuminating Foundation – I’m crazy about this one! It’s more of a tinted moisturiser but has a gentle shimmer to it that makes your skin look like it’s glowing. Not much coverage just a warming and shimmering effect but looks amazing. I tried the “Dawn Glow” which looked a bit orangey in the bottle but made my skin look warm and slightly tanned. This actually won “Best Skin Perfector” at 2013 Natural Health Awards. I can’t believe it’s taken 3 years for me to discover it! Living Nature Foundation – If you want a bit more coverage they do this foundation as well. I tried “Pure Sand” which was a good colour. Decent coverage but lightweight and full of vitamins and oils. Also wonderful. Dr.Hauschka Foundation – I’ve been aware of this brand for years as they are one of the pioneers of natural and organic skincare. I’ve used various products of theirs but never their foundation until now and it is fabulous. It gives good coverage while not being too heavy (key for me) and truly makes your skin look pretty damn good while evening out skin tone perfectly. Lovely creamy texture (thanks to macadamia and coconut oils) and smells heavenly. Comes in 5 shades. I tried “02 Almond” which seemed to be perfect with my complexion. I’ve recently tried Lavera fluid foundation & like the smooth light coverage it gives. It’s also not expensive, unlike so many of the natural brands. I love their foundations especially the one I mention in the article. All the foundations were from the brilliant Love Lula site. Just click on the links in the article. I’m becoming a desperate woman, I have orange peel effect on my chin. I’ve tried numerous pore minimisers but they just seem to sink in. Any suggestions. I’m 56.